2005 Floor Drain with Adjustable Strainer Head - Jay R. Smith MFG Co.
General service floor drain for use in showers, toilets, kitchens and other finished areas where foot traffic is expected. 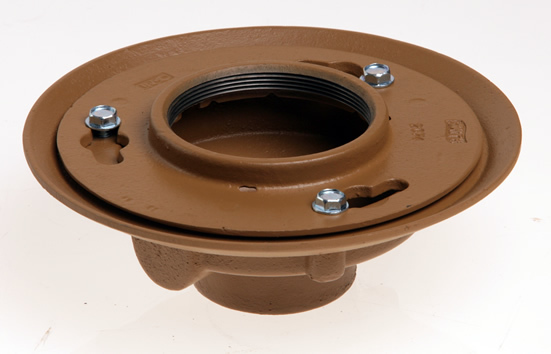 The round top strainer head is used for all types of poured finished floors. The square top is particularly adaptable to floors that are finished in material of square or straight line pattern. Reversible flashing collar permits adjustment of the strainer to meet finished floor level. Duco Cast Iron Body with Flashing Collar and Adjustable Strainer Head as Indicated by Suffix Letter Selected.